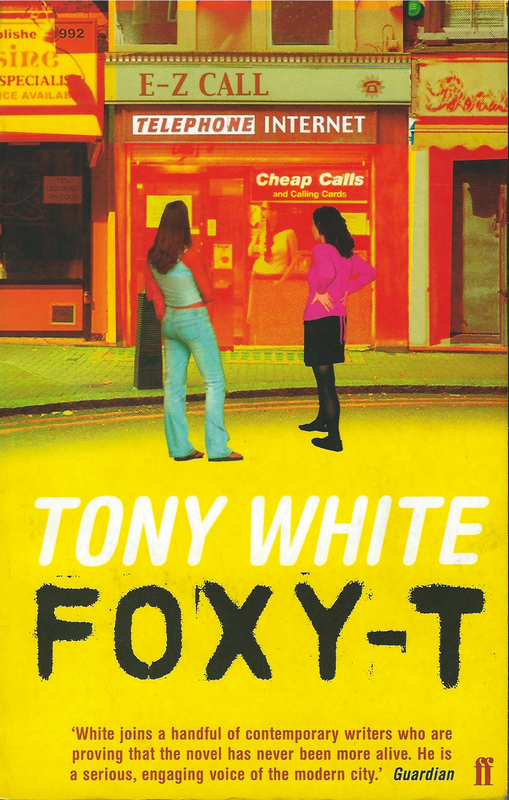 The front of Ghost’s design for the paperback of Foxy-T—with its collage-effect street scene depiction of the E-Z Call—was never going to be quite as striking as Gray318’s stark wrap-around design for the jacketed demy paperback first edition, although it more or less picks up the yellow, red and black palette. Of course the most important thing about this design is the Faber and Faber logo at bottom right, but between you and me, I’m not sure I was ever totally convinced by the two rather static figures standing with their backs to us. What are they doing there, and why are they standing in the road? I suppose it is pretty obvious that they are meant to be the novel’s main characters—who we know as Foxy-T and Ruji-babes—but it is probably also inevitable that I wouldn’t feel the pictures quite do the characters justice! Nice typography though, and a great back cover!